For the French furnishings house Roche Bobois, our Creative Director, (interior designer Michael Tavano) has conjured a luxurious master bedroom/sitting room suite at Holiday House NYC 2014. 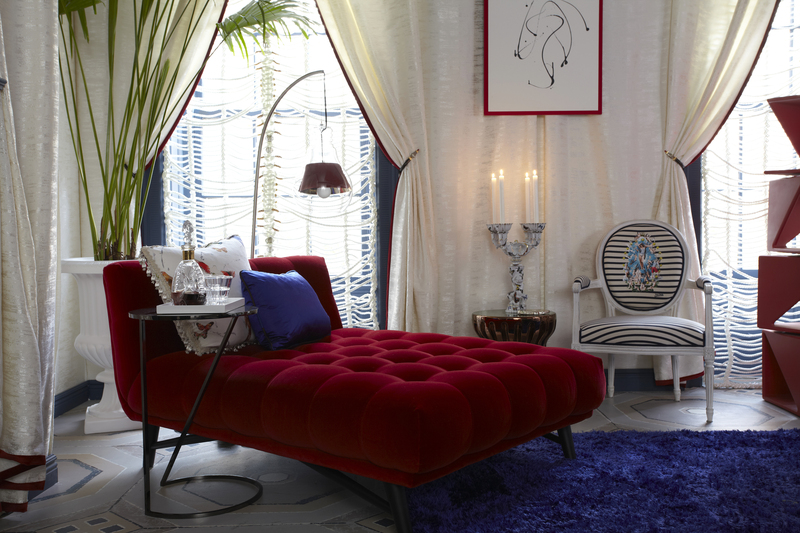 Hued in blue, white and red, the room’s holiday-theme is Le Quatorze Julliet, the French national independence day. In it, he celebrates that certain French style, that je ne sais quoi which infuses a free-spirited individuality into both design and fashion. The room design was influenced by the sleek, organic lines of Roche Bobois furnishings and inspired by the extravagant textures of fashion designer Olivier Rousteing’s fall 2014 runway collection for the house of Balmain. Both collections, Michael noticed, are ingeniously crafted to form-fit the curves of humans. 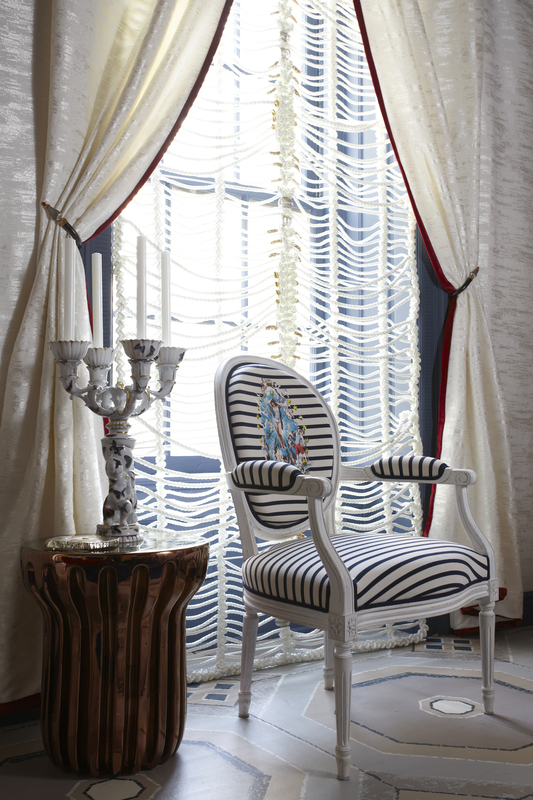 The use of texture and technique is evident in sumptuously draped walls and Roman shades crafted of rope (like those Balmain dresses), both done by our workroom. Fabric was generously donated by JAB, and trim by Samuel & Sons. donated Several separate areas for lounging and a decadently curvaceous Roche Bobois bed-as-centerpiece are all arranged so as to guide visitors through the space in a graceful arc. 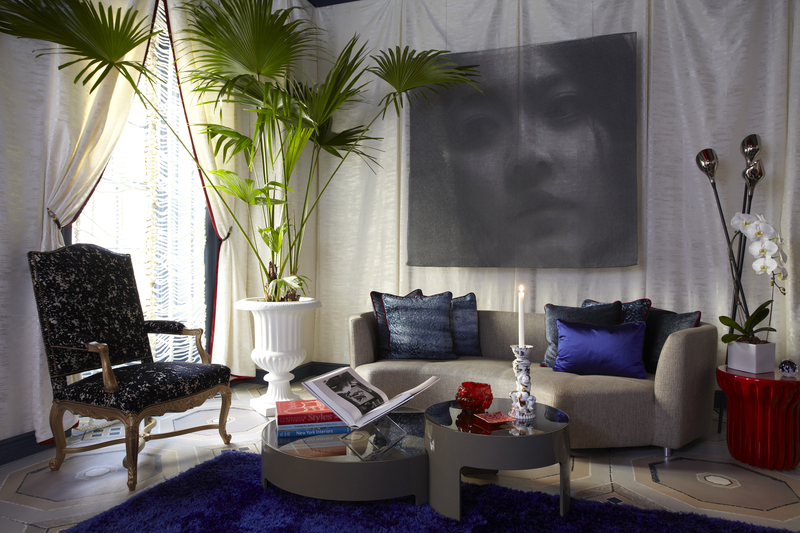 Fine art and sculpture from Kate Shin Gallery, a hand-painted floorcloth by The Alpha Workshops, dramatic chandeliers from Baroncelli and a warm fireplace complete the ambience. Holiday House benefits the Breast Cancer Research Foundation and will be open to the public 7 days a week from November 20 – December 21. For more information: michaeltavano.com, roche-bobois.com, holidayhousenyc.com, and bcrfcure.org.